I think it's going to be the what and where that will be my hurdle. I've said to myself nothing that isn't easily coverable - i.e. nothing on arms and potentially lower legs, and obviously not on neck/head/hands etc. I am considering top of foot, fairly painful, but ticks the other boxes? Paul Rollett at Eclipse in Heanor Derbyshire. Most of my early work was done by Jack and Sean Zeek, Derek Campbell and George Bone, all in West London. Try some EMLA cream, rub it in the area an hour before the tat, it numbs the skin for about 2 hours. Here is mine. It's a Northern Soul theme Time will pass you by. Keep the faith in a watch design. A little different from the normal Northern Soul logo. One I designed as a 1 off. This is where I'm at with my back. The Geisha was started in 1987 when I was 17. I thought I was the toughest rogue in West London, shaved head, bleached jeans and a cross earring. It took all of 30 seconds in the chair to reduce me to what I really was, . . . A kid ! 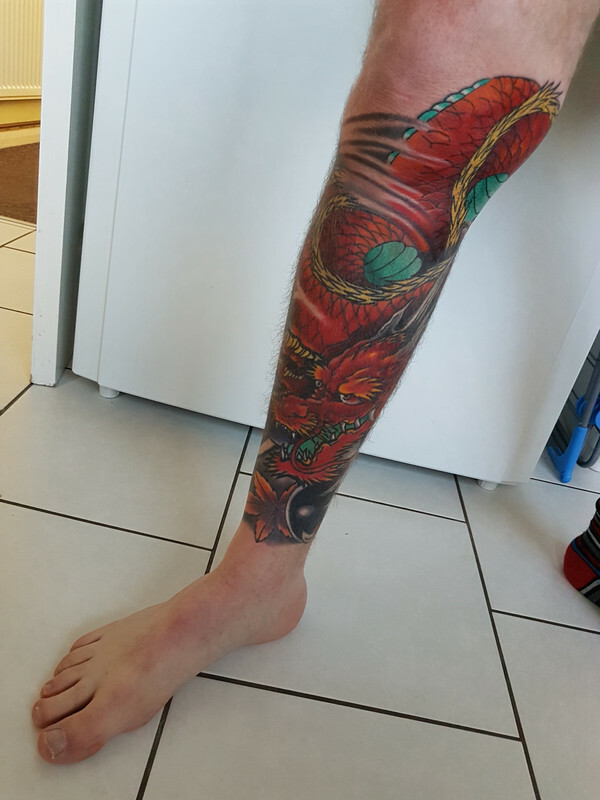 It stayed half finished for 15 years until I mustered the courage to have it re worked. I got half way thorough and called time again! Earlier this year, after my chest, belly and ribs were completed , it was time to start on my back. 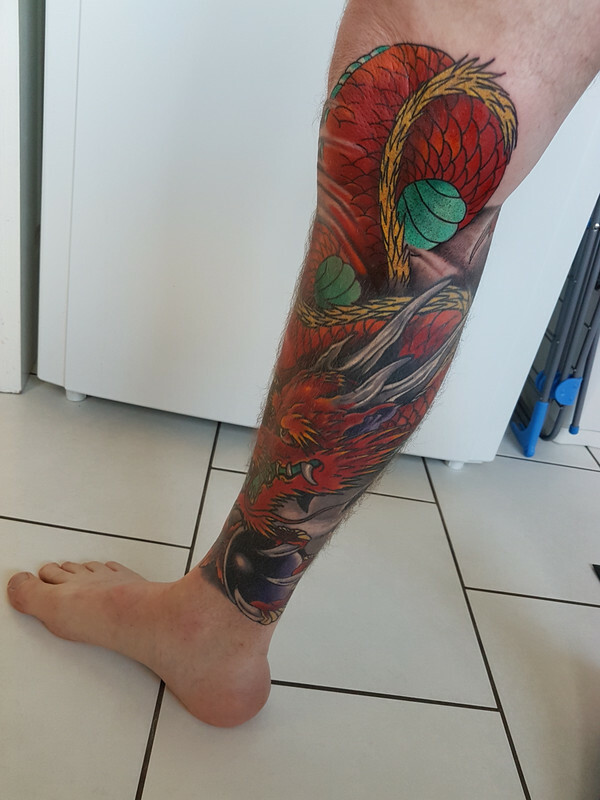 Paul relined it, shaded and coloured it in just under 4 hours. 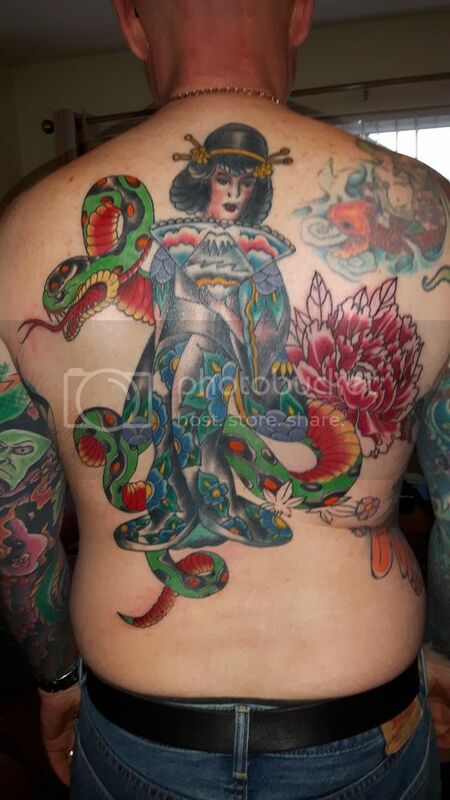 Since then I've had the snake and peony done. Sorry to hear about your wife Paul, best wishes to you both. 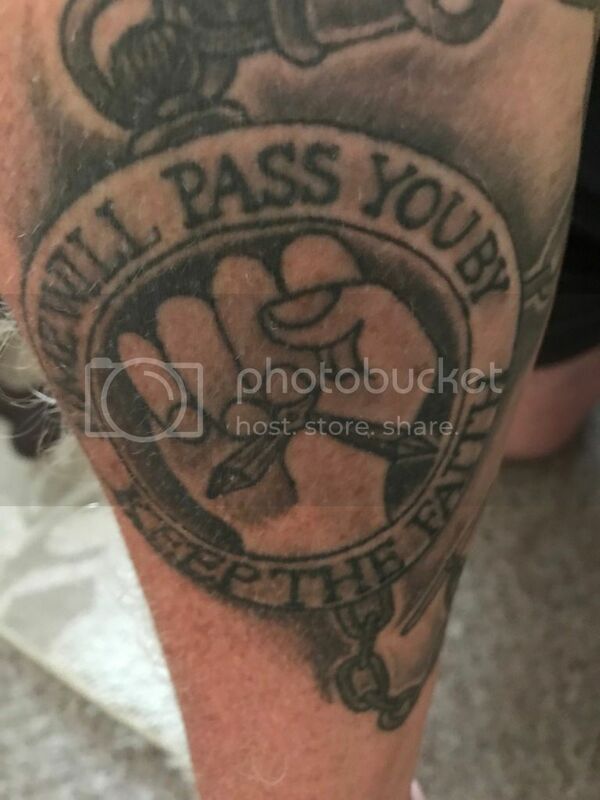 Not my wife, Pat , it's Paul the tattooists wife who is ill. The poor lady has cancer. It's the fourth time she's had it. We ought to count ourselves lucky. . . .
sorry about the post above fella, feel a right eejit now ! It's easy to misread stuff. . . Especially when we've got shaving products on our minds ! I'm at the tattooIst again this morning. My first sitting in nearly three months. My knee is smothered in numbing cream and wrapped in cling film ! I find the numbing cream works for around 40 minutes to an hour, which helps to ease me into the sitting. I'll post some pics later . 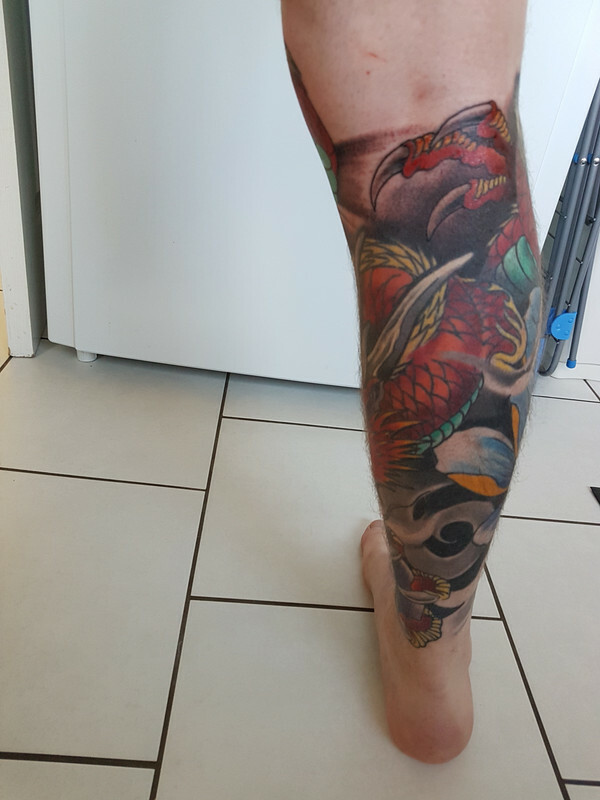 . .
A quick pic of where I'm up to with my right leg. 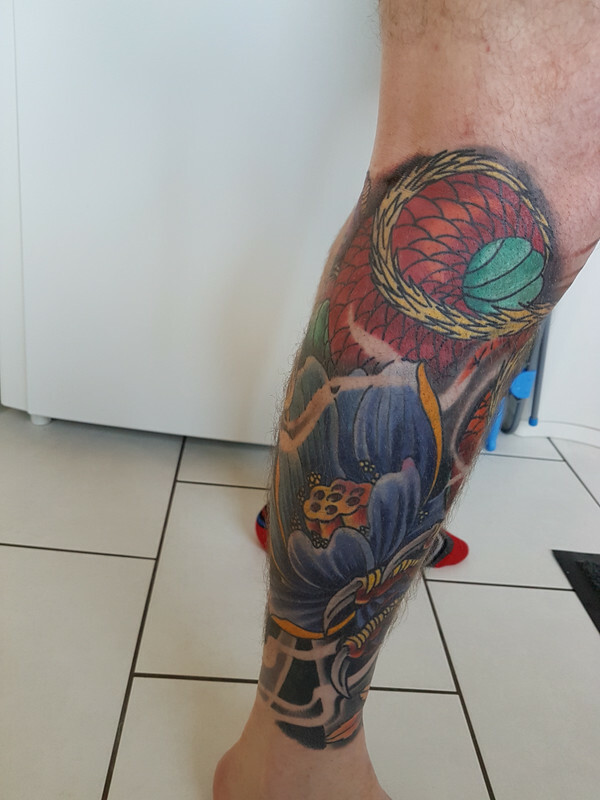 Inside and rear of knee done today. 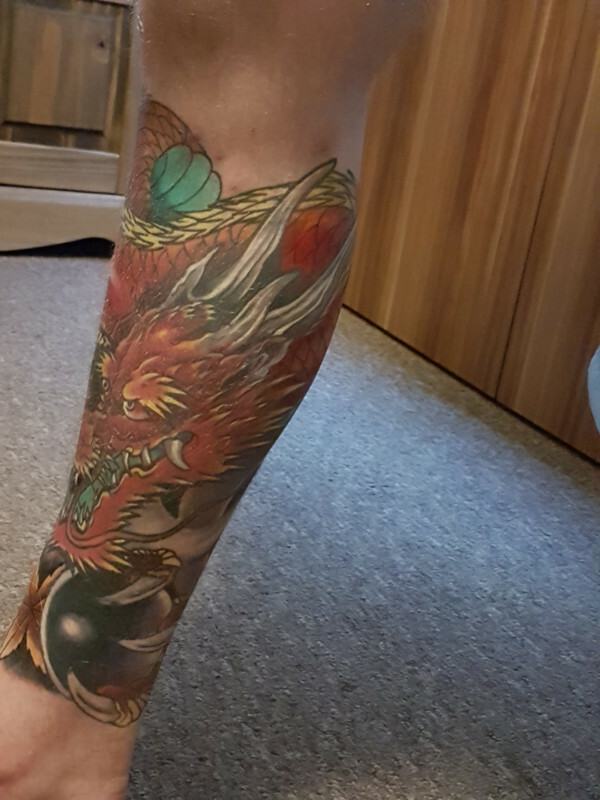 Are you going for a full sleeve ?